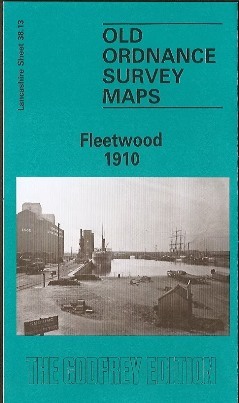 This detailed map covers the town of Fleetwood. Most of the town centre is shown and coverage extends southward to Wyre Street, westward to Cemetery Lane. Major features include the town centre shown in detail with all individual buildings; Wyre Dock with sidings, fish packing sheds, warehouses etc; North Lancashire Saw Mills, tramways with two tramcar sheds, Warrenhurst, cemetery, The Hutments, The Mount, Pharos Place with lighthouse, North Euston Hotel, Quay, China Clay Warehouse. Railway information includes track layout with Wyre Dock and Fleetwood stations. On the reverse are extracts from a contemporary commercial directory.